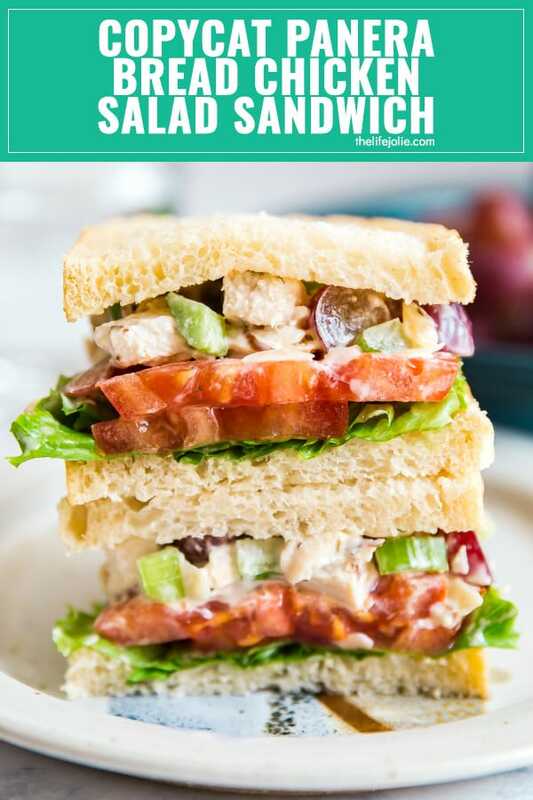 Copycat Panera Bread Napa Almond Chicken Salad Sandwich is one of my favorite light lunches. It’s seriously quick and easy to make and a great way to repurpose leftover chicken! Raise your hand if you love Panera Bread! 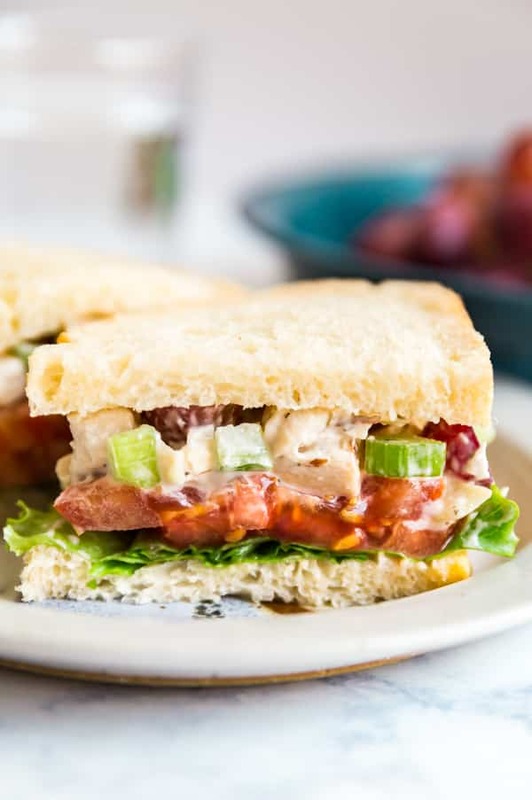 *waves both hands excitedly in the air* I’ve been a long time Panera Bread fan and one of my favorite things to order is their Napa Almond Chicken Salad Sandwich. 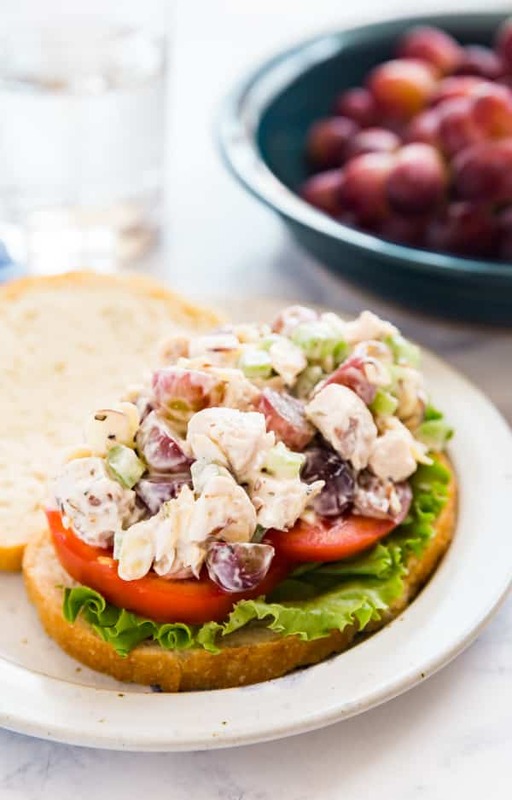 This chicken salad with grapes, sliced almonds and celery always tastes fantastic and makes the perfect light lunch! It’s always good to have a few good chicken salad recipes up your sleeve (like these Chicken Salad Stuffed Tomatoes, which make an excellent, healthy appetizer!). It’s a great way to repurpose your dinner into a light lunch the next day. Can I use leftover chicken instead of cooking the chicken as you do in the recipe? If you already have leftover chicken, feel free to use that instead. What if I’m only cooking for one or two people? This makes a pretty good amount for chicken salad so if you’re cooking for one or two and don’t want leftovers, feel free to halve the recipe. Is there a good way to make this recipe low carb? Sure! 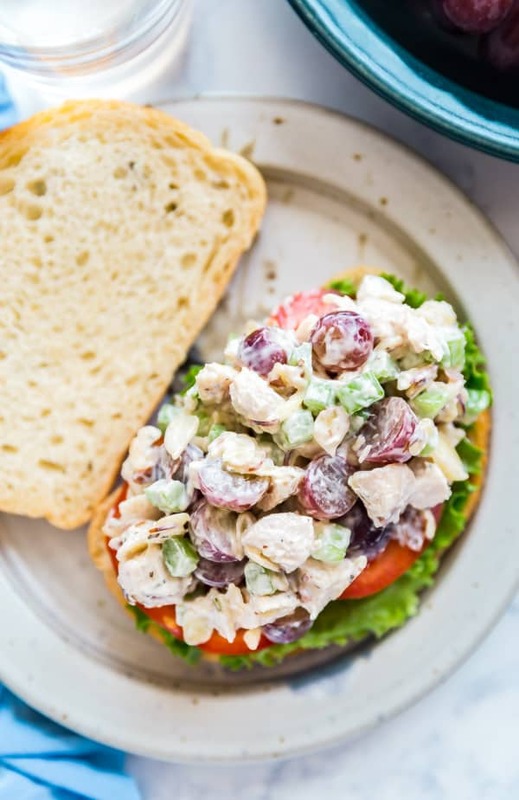 This homemade chicken salad would taste great as lettuce wraps or stuffed into hollowed out tomatoes or avocados. Can this be made ahead? Yes. The chicken salad lasts a few days in the fridge. Store it in an air-tight container. I’d encourage you to assemble the sandwiches just before serving so that the bread doesn’t get soggy. 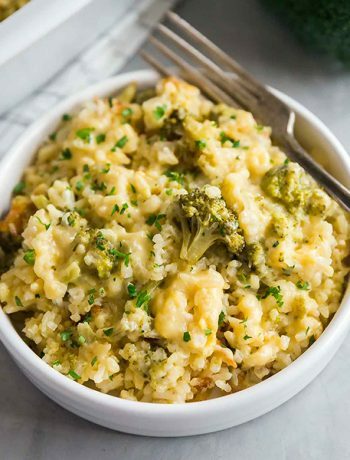 Any tips for making this recipe a bit healthier? Although the recipe is pretty light to begin with, if you want to make it even lighter, you can use a light mayonnaise and substitute greek yogurt in place of sour cream (or just use light sour cream). What if I’m not a fan of sour dough bread? Then you and I are done! Just kidding, you can totally change out the bread and totally get creative with the toppings! 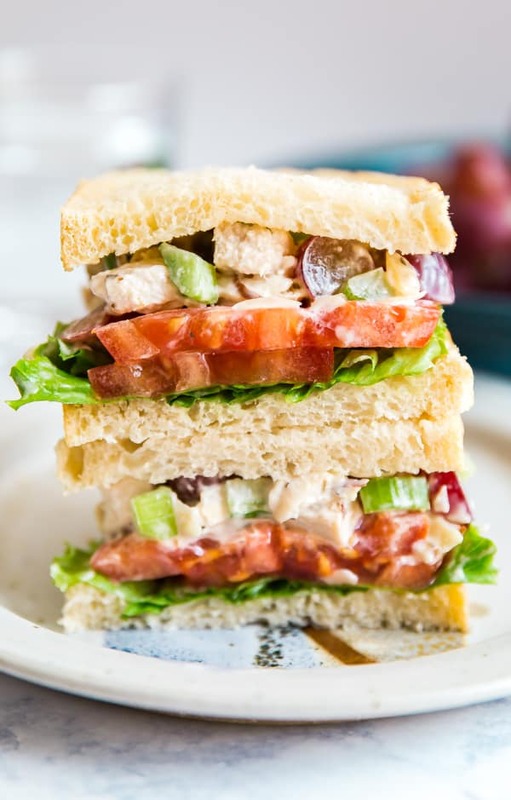 Copycat Panera Bread Napa Almond Chicken Salad Sandwich is one of my favorite light lunches. 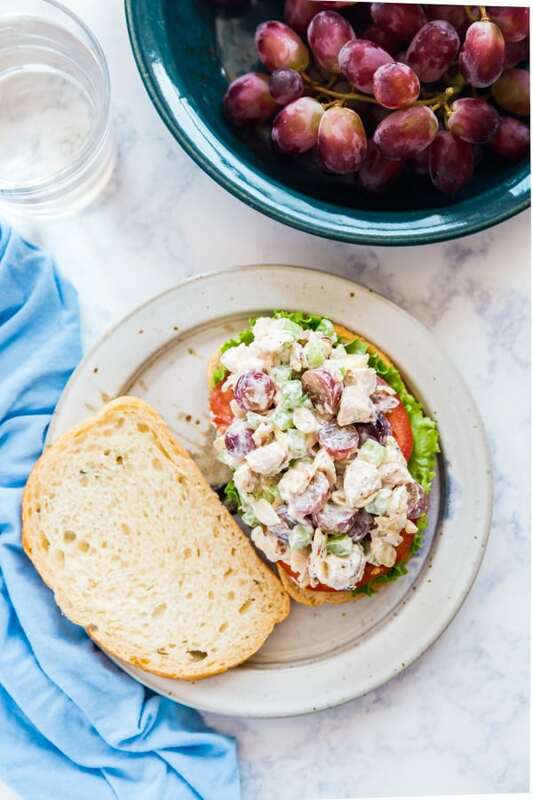 Made with grapes, almonds and celery, it's seriously quick and easy to make and a great way to repurpose leftover chicken! Preheat the oven to 400. Line a sheet pan with a silicone line or foil. If using foil, spray with cooking spray. Place the chicken breasts onto the pan. Lightly sprinkle with lemon pepper and a bit of salt (to taste). 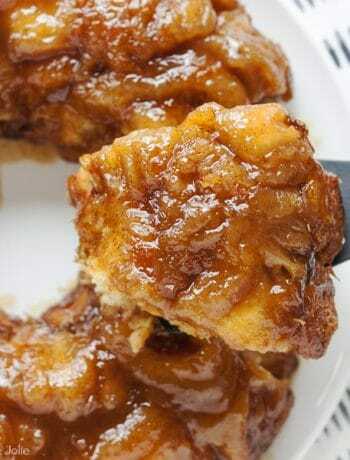 Bake for 25 minutes or until they reach an internal temperature of 165 degrees. Cool the chicken and chop. Add the chicken into a large mixing bowl. Add all the other ingredients and mix everything until well combined. Taste for seasoning and add more if necessary. Place the first piece of bread on the cutting board. Add the lettuce and then the tomatoes onto the bread. Top them with a good layer of chicken salad. Cover with the other piece of bread and cut the sandwich in half. Serve immediately. 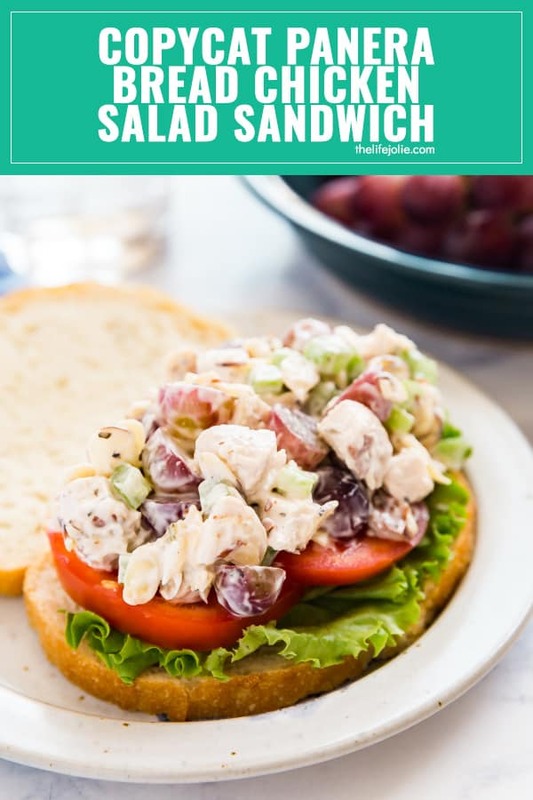 Chicken salad can be stored in an air-tight container in the fridge for up to a few days. 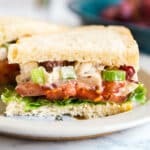 Looking for some other easy sandwich recipes? 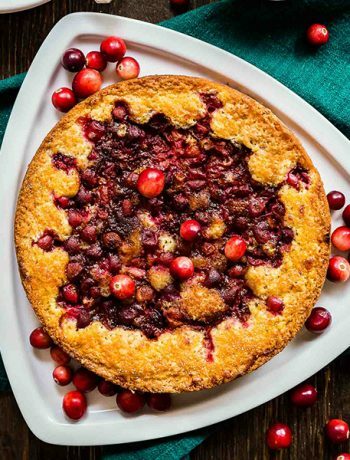 March 1, 2019 at 3:05 pm Thank you so much for this recipe!! I am thrilled with the taste, the fact that it's right in my fridge and the money I'm saving by not buying the sandwich!!! March 2, 2019 at 12:01 pm Woohoo- so glad you like it Wendy!